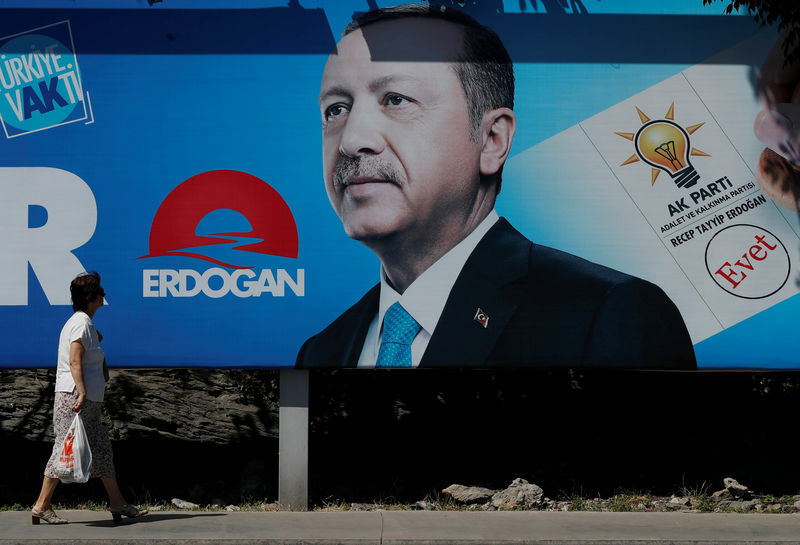 ISTANBUL (Reuters) – Turkish President Tayyip Erdogan has threatened to take action against Moody’s after June 24 elections, his latest broadside against credit rating agencies that he says are trying to bring down the economy. Erdogan, a self-described “enemy of interest rates”, has long cast chronic weakness in the lira currency as the work of Western powers determined to weaken his government. He has ascribed the sell-off to a shadowy “interest rate lobby” and has repeatedly singled out Moody’s, Standard & Poor’s and Fitch for their criticism of Turkey’s economy. All three agencies rate Turkey’s debt as “junk”, or non-investment grade, and have highlighted concern about the economic outlook given rising authoritarianism and Erdogan’s drive for lower interest rates. “God willing, after June 24 we will mount an operation on that Moody’s,” Erdogan said during an interview with private broadcaster 24 TV late on Wednesday. A spokeswoman for Moody’s declined to comment. Erdogan did not elaborate on the nature of the potential action, but his comment that Turkey was not a “member” of Moody’s suggested he may have been referring to a different agency altogether, Standard & Poor’s. Turkey solicits ratings from Moody’s and Fitch. Its rating from S&P is unsolicited. Since many international funds require two ratings to invest in a country’s debt, investor sentiment would be impacted if Turkey were to drop Moody’s. The lira was slightly firmer on the day at 4.6300 to the dollar at 1256 GMT, as investors appeared to shrug off the comments. Moody’s last week downgraded and placed on review for further downgrade the ratings of 17 Turkish banks. It said the downgrades reflected its view that “the operating environment in Turkey has deteriorated, with negative implications for the institutions’ funding profiles”. The lira has fallen some 18 percent this year, hitting a series of record lows and forcing the central bank to aggressively hike rates to stop the sell-off. Erdogan and his ruling AK Party face presidential and parliamentary elections on June 24.